Tissus imprimés à la main! Announcement Welcome to the TRACEtextile's ETSY shop! Welcome to the TRACEtextile's ETSY shop! Love this - it is exquisite! Such lush colors. Thank you! Nous adorons notre nouvelle nappe ! Elle est encore plus belle en personne, excellente qualité. Merci ! Rideaux imprimés avec couleurs personnalisées aujourd'hui! Le client est content. On continue le shooting photos des nappes avec un soleil magnifique! gâteau aux pommes sur notre jolie nappe TRACE. TRACE textile is a dream to join my passion of creation and design. After working in architecture and interior design, I missed the hands-on work and direct contact with the materials. I started my own business in design and hand printed textiles in 2007. 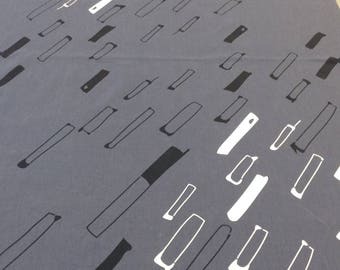 TRACE textile is a beautiful selection of abstract and minimalist designs. All my textiles are a limited local production of hand printed silk screens. Hello! My name is Florence, I'm the artist under TRACE textile's creations, a label of hand printed textile with my own designs! I'm passionate about textile and seelk screen. Welcome! Hi and welcome to Trace textile! My name is Florence and I'm a textile designer, seelkscreen printer from Eastern township in Quebec, Canada. All the products on my shop are hand made and can have some differences between each other. At theTrace textile studio each piece is printed by hand resulting in slight variations in markings and colour, making each piece totally unique! While I aim to display each item as accurately as possible on my website, the actual colours you see will depend on your computer monitor or printer. I cannot guarantee that the display of any colour will exactly reflect the colour of the item on delivery. I create regularly new designs so don't hesitate to visit my shop frequently! You can also follow me on facebook or instagram to know more about my work. I do not except refunds unless the goods are faulty or damaged. All orders are carefully checked and packaged to ensure a safe delivery, in the event that you receive an item that is faulty or damaged, please contact me within 24 hours to arrange a refund or replacement. Unfortunately once posted I do not accept responsibility for lost or damaged parcels, but I do offer insurance at an extra cost. I accept Paypal payment or direct payment. I cannot accept checks or cash tranfer. Thanks for comprehension. Your order will be shipped after I received a confirmation of your payment. If the payment is not done after 48 hours, I will contact you by message but in all cases, Etsy will be notified and the order will be canceled. If you have any questions, don't hesitate to contact me before to complete your order. I will answer you as better and soon as I can. Le colis vous sera envoyé dans un délais de 3 à 5 jours ouvrables ou mieux! - L'expédition est faite par poste Canada et à l'international sans suivi ni assurance, afin de conserver des tarifs d'expédition abordables. Si vous souhaitez une souscription d'assurance ou un suivi de votre envoi, merci de me contacter avant toute commande, afin de calculer les coûts supplémentaires et adapter la fiche produit à cette option. - Je ne saurais en aucun cas être tenue responsable des retards de livraison ou de tout autre incident survenant durant l'expédition et la livraison. Je prépare avec soin les colis et prend toutes les précautions nécessaires à une expédition en toute sécurité. 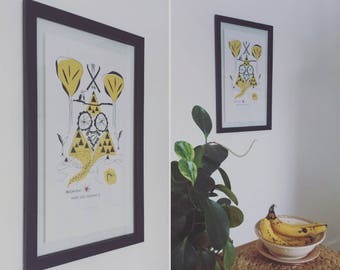 - Toutes les commandes sont expédiées à l'adresse postale spécifiée sur votre bon de commande Etsy, et non pas à l'adresse Paypal. Merci de bien vérifier que vous avez renseigné la bonne adresse (notamment si différente de l'adresse de facturation), je ne saurais en aucun cas être tenue responsable des colis envoyés à des adresses périmées ou incorrectes. - Merci de bien noter qu'il peut arriver que des charges vous soit demandées lors de la réception de votre colis (notamment s'il y a des frais de douane), auquel cas je ne suis pas responsable et ces taxes restent donc à votre charge, sachez que je fais mon possible pour éviter ce type de désagrément. The personnalised special order are welcome! It will be a pleasure to work with you for your peronnal needs or commercial project! At the Trace textile studio, each piece is printed by hand resulting in slight variations in markings and colour, making each piece totally unique! Gentle hand or machine wash. Air dry and iron on reverse side of print. Please do not bleach, tumble dry or Dry clean.